Gallery Tate Modern first invites to the exhibition of the outstanding British artist Richard Hamilton. There will be a retrospective of his sixty-year career - from the earliest to the latest exhibition of works of paintings. 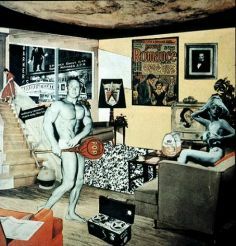 Richard Hamilton is considered one of the founders of the new generation in art - pop art, covering the period 1950 - 1960 years. And the first picture, which received the status icons "popular art" was his work entitled "Just what is it that makes today's homes so different, so appealing?". Visiting London gallery, from February 13 to May 26, 2014, you can see all of the unique work of this legendary creative personality.